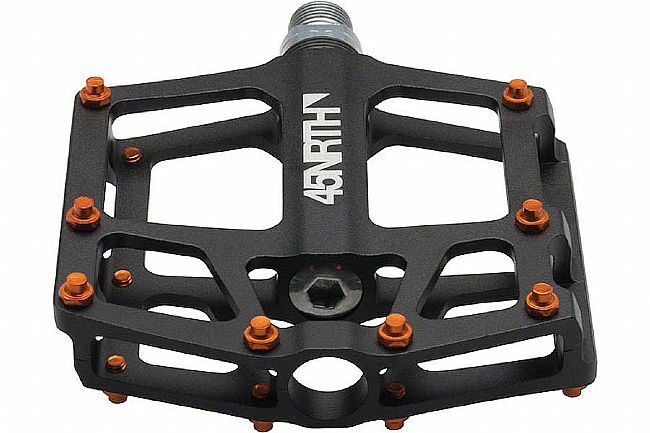 The Heiruspecs Platform Pedal from 45Nrth features a wide, concave, open body platform that easily sheds dirt and snow. 16 replaceable aluminum pins spread throughout provide a secure grip to non-cleated flat bottom shoes and enhanced control. Replacement pin kit not included. Dimensions: 100 x 100 x 18mm (W x L x H). Extruded 6061 aluminum; CNC machined; anodized.